The full soundtrack of the video game ZHEROS: an explosive mix of EDM, dubstep, underground music and craziness! Explosive electronics sounds take you in a journey to discover the futuristic world of ZHEROS and do shoot up the level of adrenaline. The full soundtrack of the video game ZHEROS: an explosive mix of EDM, dubstep, underground music and craziness! Explosive electronics sounds take you in a journey to discover the futuristic world of ZHEROS and do shoot up the level of adrenaline during the fighting. 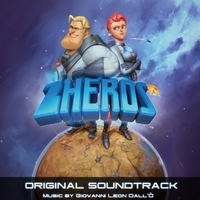 The Author of the soundtrack, Giovanni Leon Dall'O' writes music for multimedia since 2000. Graduaded in music and new tecnology with honors. He composed the soundrack for the films Revolver and Moto Perpetuo, selected and shown in "Taormina film Fest, 2011". In 2014 founded Shine Records, an italian music label. In 2012 he founded the Shine Orchestra with which performed the orchestral concert “Dehesmael - Music from the world of dreams”, with an original story and music of his own composition. Shine Records produced and published his albums: Elektra, Avantgarde, Ambiental suggestions and Sicilia in musica. He's the winner of the "Poggio Bustone National Festival" in 2014.